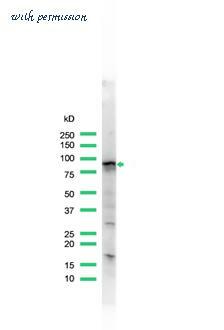 The STAT5A antibody from Proteintech is a rabbit polyclonal antibody to a recombinant protein of human STAT5A. This antibody recognizes human,mouse,rat antigen. 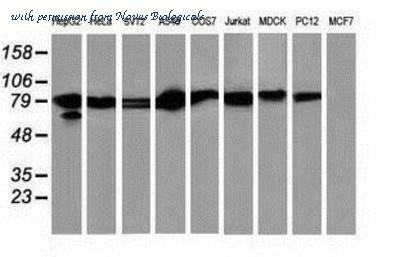 The STAT5A antibody has been validated for the following applications: ELISA, WB, IHC, FC, IP analysis. 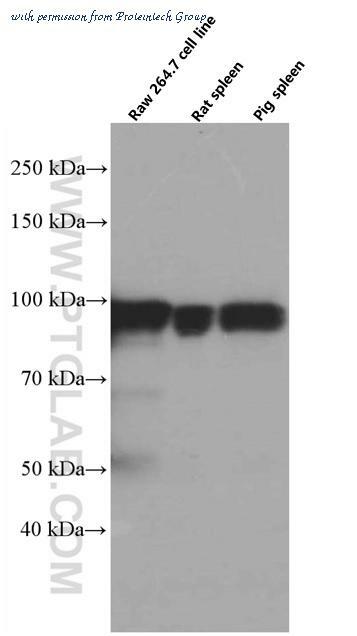 Western Blot: STAT5A Antibody (9F7) [NBP2-00622] Analysis of extracts (35ug) from 9 different cell lines by using anti-STAT5A monoclonal antibody. 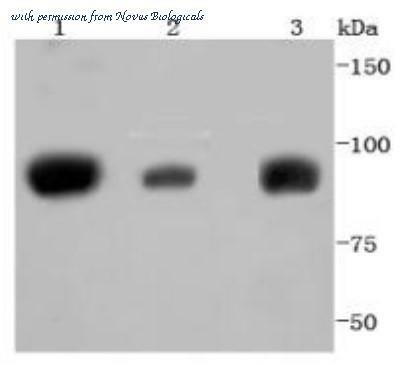 Western blot using Rockland's affinity purified anti-Stat5 pY694 antibody shows detection of phosphorylated Stat5 (indicated by arrowhead at ~91 kDa) in NK92 cells after 30 min treatment with 1Ku of IL-2 (lane 2). No reactivity is seen for non-phosphorylated Stat5 in untreated cells (lane 1). The membrane was probed with the primary antibody at a 1:1,000 dilution, overnight at 4° C. Personal Communication from Ana Gamero, CCR-NCI, Bethesda, MD. Immunohistochemistry using Rockland's Anti-Stat5 pY694 monoclonal antibody shows detection of phosphorylated Stat5pY694 in human breast tissue (40X). 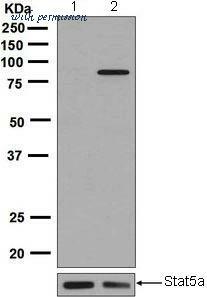 The antibody was used a dilution to 20 µg/mL. 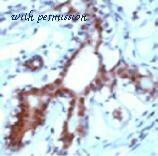 The image shows breast epithelium with moderate nuclear staining. Tissue was formalin fixed and paraffin embedded. No pre-treatment of sample was required. The image shows the localization of antibody as the precipitated red signal, with a hematoxylin purple nuclear counterstain. Personal communication, Andrew Elston, Lifespan Biosciences, Seattle, WA. 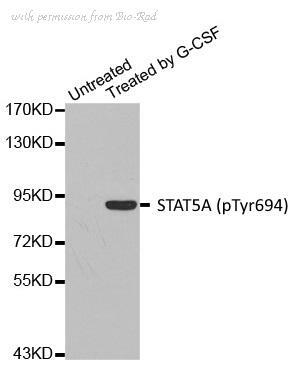 Immunohistochemistry using Rockland Immunochemicals Anti-STAT5 pY694 monoclonal antibody shows detection of phosphorylated STAT5 pY694 in human breast tissue (40X). 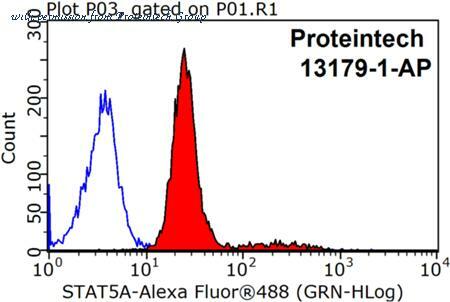 The antibody was used a dilution to 20 µg/mL. 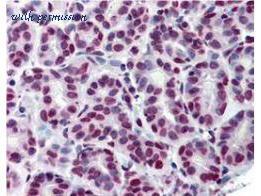 The image shows breast epithelium with moderate nuclear staining. Tissue was formalin fixed and paraffin embedded. No pre-treatment of sample was required. The image shows the localization of antibody as the precipitated red signal, with a hematoxylin purple nuclear counterstain. Personal communication, Andrew Elston, Lifespan Biosciences, Seattle, WA. 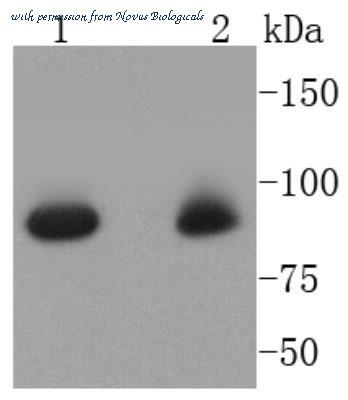 Western Blot analysis of K562 cell lysate with Stat5alpha pAb.